As adult acne can be VERY confusing, let a skin doctor tell you the truth. When do annoying spots suddenly become "adult acne?" Can you blame diet, lifestyle or genetics? Is makeup your friend or foe? And how can you really get rid of it? Instead of getting conflicting responses from a Google search, here Consultant Dermatologist, Dr. Anjali Mahto from London clinic Cadogan Cosmetics, tells us everything you need to know about the skin condition. Thankfully it's totally BS-free. Many of my patients believe that acne is different to spots. In fact there is no real difference between these two words. Acne is the medical term doctors use to describe bad spots, and can be medically treated. Acne can occur during teenage and adult years. In adults, the condition consists of two subtypes: Persistent acne—that continues from teenage years and fails to clear; and late-onset acne—beginning after the age of 25 years. Acne in adulthood is much more common in women compared to men. Somewhere between 12-22% of women will suffer from acne as an adult compared to about 3% of men.This is because women are more sensitive to hormonal changes, for example, during the menstrual cycle many will find their skin worsening before their periods. Genetics have a large part to play in the development of acne. Some studies have suggested that nearly 80% of acne is due to the presence of certain genes that are inherited. However, we are unfortunately still not at the stage where we understand all the causes and what we can do to reverse it. The development of acne is a multifactorial process. Acne is a disorder of the pilosebaceous unit of the skin, which is composed of an oil-producing gland, hair follicle, and hair. The size and activity of the oil-producing gland is affected by hormone levels. Under certain circumstances the gland increases in size and produces more oil. Skin cells start to become "sticky," trapping pores. Bacteria known as P. acnes multiply and these factors result in spots. There is some evidence that consumption of dairy and foods with a high GI-index can aggravate acne so I suggest my clients limit these and for them to lead a healthy lifestyle. Anecdotally, stress can aggravate many skin diseases, including acne, so finding methods of reducing this e.g. through exercise or meditation may indirectly have some benefit. The role of chocolate and its effects on acne remains controversial. A recent laboratory study showed chocolate consumption in the presence of P. acnes bacteria resulted in the increased release of chemicals that cause inflammation. However, the link remains tenuous and it may be a specific constituent in chocolate itself that may have a role to play for example cow's milk, which is known to contain hormones and sugar. Well-designed clinical studies in the future will establish the real role of diet as a causative factor for acne but currently I recommend everything in moderation. 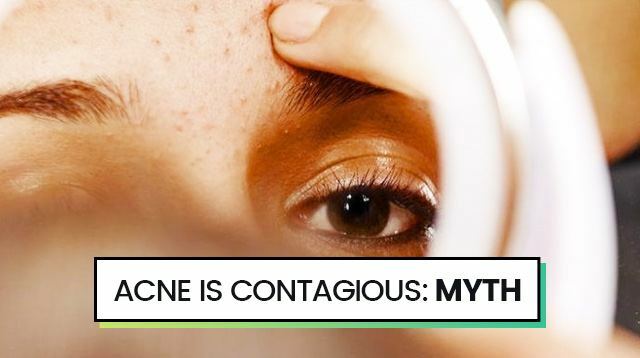 Acne is not contagious and cannot spread from person to person. Whilst acne bacteria has a role to play in its development, it cannot be transmitted like most bacterial infections. It is, however, not a good idea to share towels or pillows with someone else for general hygiene reasons. Moisturizing the skin maintains the integrity of barrier function and is vital for good skin health. Even oily skin needs moisturizing as excess oils do not equate to effective skin hydration. It is important to follow a consistent good skincare routine. Skin should be washed twice a day—morning and evening with a cleanser specially formulated for acne (these products often contain salicylic acid or benzoyl peroxide). After cleansing, use a light gel-based moisturizer that is "non-comedogenic" as this prevents the formation of blackheads. Finally, using a prescribed retinoid product on the skin before bed will help unclog pores, reduce the formation of blackheads or whiteheads, and calm inflammation. A common myth about dealing with acne is to avoid using abrasive products. It is actually good for those with oily skin to gently exfoliate once a week, as it immediately removes the dead skin cells from the surface resulting in a brighter appearance, and in the longer term, reduce the development of blackheads. It is important not to overdo exfoliation otherwise you will end up irritating the skin and making things worse not better. It is not advisable to pick, scratch, or squeeze your spots. All of these lead to skin damage and can potentially result in permanent pigmentation marks or scarring of the skin. It is better to use a spot-directed treatment directly onto the area such as salicylic acid, which can dry it up and help settle inflammation. If spots are an on-going issue, then it is a good idea to see a dermatologist who will be able to give you advice regarding skincare and treatments. There is no need to avoid makeup if you have acne and many people choose to conceal their spots as it provides self-confidence. It is important to choose the right products for oily, blemish prone skin, like an oil-free foundation or BB cream that provides the coverage you need. Steroid injections are a useful method for treating large, stubborn, solitary acne cysts, or if a rapid response is required like before an important social event. Steroids can be injected directly into the acnelesion and this results in flattening of the cyst within 42-72 hours. This procedure should only be done under the guidance of a dermatologist, as there are potential risks with the procedure if carried out in the hands of a non-specialist. Cheek and jawline acne can result from phone use. Touchscreens contain large numbers of bacteria on their surface and placing your phone against your cheek creates pressure that may activate your oil-producing or sebaceous glands. This is also combined with heat generated from the phone. Jawline and around the mouth acne affecting the lower half of the face has often been linked to hormonal changes, particularly in women that develop spots at a later age. This can often manifest as deep, red painful cysts under the skin rather than blackheads or whiteheads.